Rick Hess: So, Tony. You know that the story here is disconcerting at first look. Can you offer any more context or backstory that we should know? Tony Bennett: The backstory is simple here, Rick. In our first run of the new school calculations in Indiana, we turned up an anomaly in the results. As we were looking at the grades we were giving our schools, we realized that state law created an unfair penalty for schools that didn't have 11th and 12th grades. Statewide, there were 13 schools in question had unusual grade configurations. The data for grades 11 and 12 came in as zero. When we caught it, we fixed it. That's what this is all about. RH: And Christel House is one of those 13? Now, that actually appears to be true: the high school grade as calculated by IN-DOE includes a score given for graduation rates, which a school like Christel House - which doesn't yet have a senior class - couldn't earn. There's also a chance for a boost if a high school gets enough students to pass an AP or IB test (talk about a bias towards affluent schools; and does the IN-DOE pay for the administration of AP and IB tests?). So, sure, maybe Christel did suffer because it didn't yet have upperclassmen. Jon Gubera is the Chief Accountability Officer at IN-DOE, and it was his assessment that Christel House's 10th grade Algebra I results were "terrible." Indeed, the 2012 School Performance Report for Christel House Academy shows only 23.1 percent of students who took the Math End of Course Assessment (ECA) passed, compared to a 69.4 percent of students statewide. And when you look at the historical data, it's even more damning for Christel House. The Indiana state database for the ECA reports no test results for Christel House in Algebra for 2011 (they did report scores for Biology, which, to my mind, lessens the chance that this is a reporting error). In 2010, 21 8th graders took the Algebra ECA; only 4 passed, a rate of 19%. I think it's safe to say all of last year's sophomores were dissuaded from taking the ECA as freshmen; unfortunately, the delay didn't help much. Let me be clear: this is not an indictment of the school. Given the high poverty rates at Christel House, this pass rate may be the result of good instruction, given challenging students. It's worth pointing out that 77.5 percent of Christel House's ECA test takers in English passed, compared to 77.0 percent across the state: that's obviously something to be proud of. I commend the students and staff of Christel House for their hard work. RH: Christel is obviously a longtime supporter of Republican candidates, including yourself. How do you respond to concerns that you reacted as you did to the Christel House results for political reasons? TB: It's unfair to characterize Christel as only a donor to Republicans. If you look into it, you'll find that she's donated to both parties. She's a champion for underprivileged children. Her work around the world and in Indianapolis is an inspiration to me. It's absurd that anyone would believe that I would do any of this for a donation. In fact, if you talk to some of my friends, they'll tell you that I maybe pay a lot less attention to this politics stuff than I sometimes should. What's absurd is to believe that any of Bennett's denials should be given credence. He made the rules, but when he didn't like how things turned out for his political patron, he changed them. Can you tell this one is really making my blood boil? Bennett was playing around with the lives of educators and children, creating a biased system that did nothing to inform instruction or improve schools. He was more worried about getting the A-F grading system to match his ideological predilections (and the needs of his campaign contributors) than he was in creating a fair, transparent metric that could help schools improve. Now he pretends that he is shocked - shocked, I say! - that anyone would dare question his integrity when it's quite clear that he gamed the system. Tony Bennett needs to resign and go into another field; the good people of Florida deserve better. 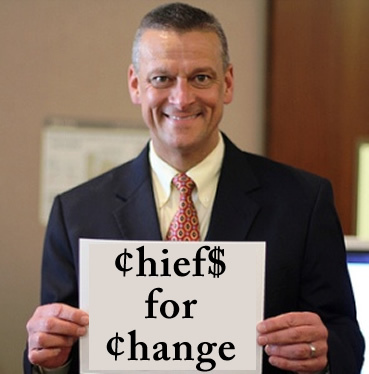 Yet another "Chiefs For Change" fail. It feels like the day after anti-reformy Christmas: we're all basking in the glow of the implosion of Tony Bennett's career. 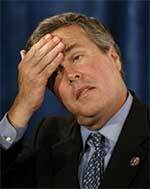 The former Indiana state education superintendent, current Florida education commissioner, and star of Jeb! Bush's Chiefs For Change is desperately scrambling to explain himself after getting caught red-handed changing the "school grade" of a charter run by a big-time Republican donor. Bennett says his department ran into problems when initial calculations indicated the school would receive a C under the statewide accountability system, which didn’t sit well with the then-superintendent. Read the emails and judge for yourself; personally, I read Bennett's frustration arising from the fact that he made himself look like a fool after running around Indiana praising Christel House Academy, the charter in question. You can certainly understand the fury of local school officials around Indiana after learning of Bennett's perfidy. "Why," they must wonder, "was Christel House given the benefit of the doubt?" It's a fair question: what made this charter so special (other than the $90,000 Christel Deehan donated to Bennett's failed re-elction bid)? The backbone of the case for the charter is that it was "beating the odds": it had just as many poor students as the public schools of Indianapolis, but was getting far better results. 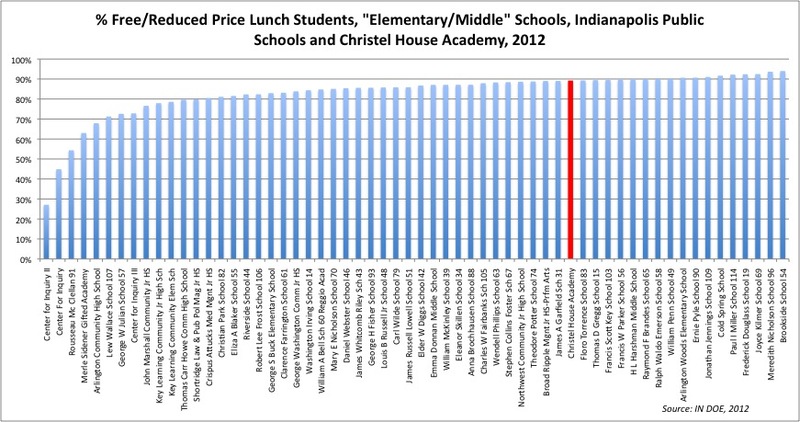 I made this chart based on data from the Indiana Department of Education. Certainly, Christel House has enrolled many children in poverty as judged by eligibility for Free or Reduced-Price Lunch. But notice how many public schools in the IPS system serve the same type of students: the vast majority are within ten percentage points of Christel House when looking at FRPL rates. Christel House is a laggard when it comes to serving special needs students. That may be because the school has a "voluntary" essay question in its application form that asks parents to: "Please describe the academic and social goals you have for your child's growth and development for the coming school year." Not exactly welcoming to the reluctant special education parent. 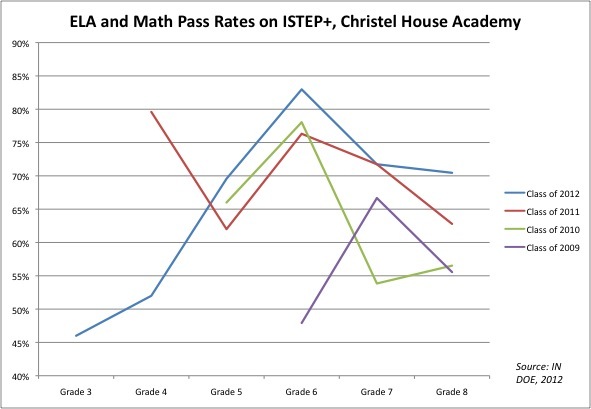 Keep all this in mind as we look at Christel House's test performance. 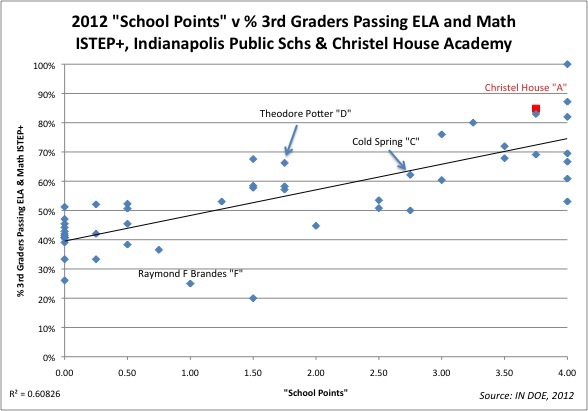 Each data point here is either an IPS school that reported scores for 4th Grade, or Christel House, which is marked in red. 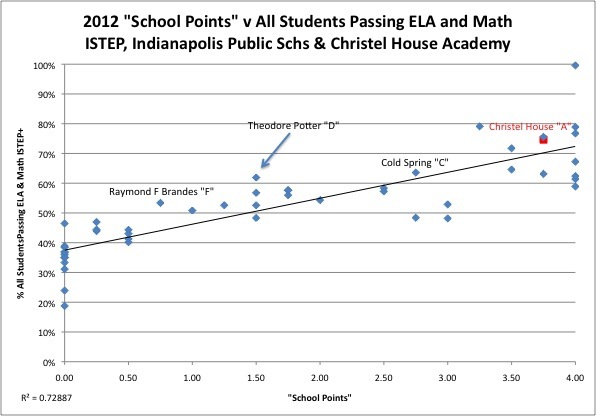 The x-axis is the grade the school received from the IN-DOE in "school points"; depending on the cutoff points, the number of school points determines the letter grade for a school. The y-axis shows the percentage of all students at the school who passed both the language arts and math exams in 2012. You'll notice the r-squared number in the bottom left; this is geek-speak, saying that about 73% of the "school points" grade can be explained by the schools' passing rates. We'll talk about this more in a bit, but for now: this is a fairly strong correlation. As Matt DiCarlo explains in a post about Indiana's school grading system, the school grade is based on "growth" - how much students improve - as well as "absolute" performance. So we don't expect the school points to match the passing rates exactly, but they do track relatively closely. At issue were the school’s low scores on statewide algebra tests. Bennett says the problem stemmed from how combined schools— that is, those that include multiple grade levels — are counted under the state’s accountability system. He says the tweaks his department made benefited a number of schools, not just Christel House, which is run by a prominent Republican donor. 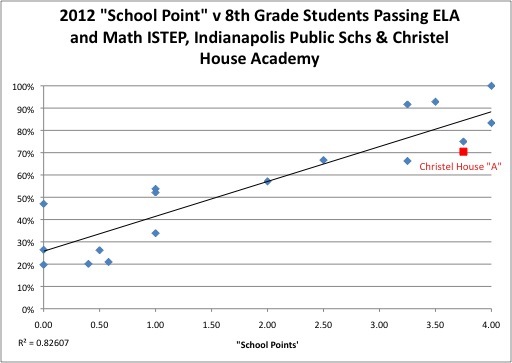 Well, if that's true, then by all rights Indianapolis's elementary schools should not be judged against the performance of Christel House's middle school students. It only makes sense: why should an elementary school be made to look bad in comparison to Christel House if they aren't even teaching the same grades? Well, things have shifted a little, but it still looks like Christel House tops the lower-graded schools. How about fifth grade? OK, wait a minute; what's going on here? Theodore Potter School, which earned a 'D' for its school grade, has more kids passing the Grade 5 state test than Christel House! And the others aren't too far behind. What about Grade 4? Well, good for Christel House this time. But you have to wonder about the wide swings in the other schools. Was 2012's fourth grade cohort at Brandes really that much superior to 2012's third grade? And what does it say that the 60 point gap in third grade between Brandes and Christel House is reduced to 27 points in sixth grade? Isn't that a good thing (even if we are talking about different cohorts of students)? Relative to other middle schools Christel is good; not a miracle worker, but very solid. It appears, however, that their high middle school scores were used to give them a boost to "A"-status, even as they fell behind lower-graded elementary schools in some of the lower grades. It seems obvious: the Indiana DOE, under Tony Bennett, gave an advantage to this combined school that made their elementary test results look superior to the schools with only younger students. "Hold on!" I hear some of you cry. "Isn't that what we actually want? Don't we want more students passing in the higher grades? 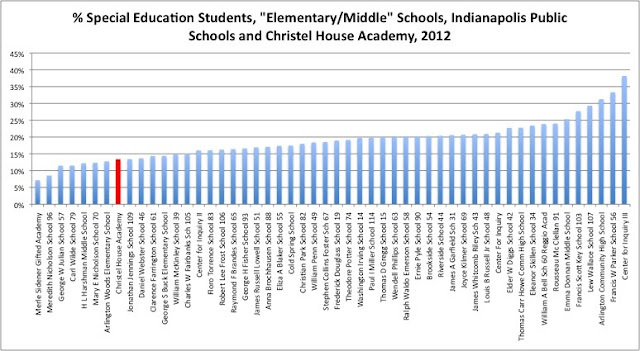 Isn't that proof that Christel House's students are 'catching up' from their slow starts?" 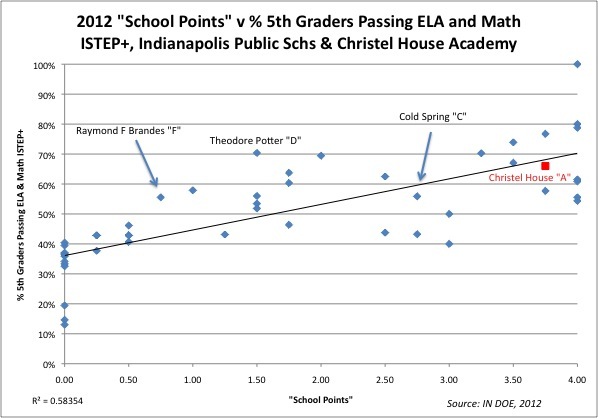 In any case, there's not much evidence here that Christel House's students "catch up" more than students in the IPS district's schools (if someone wants to look at Christel's rate changes for each cohort against other schools, be my guest). 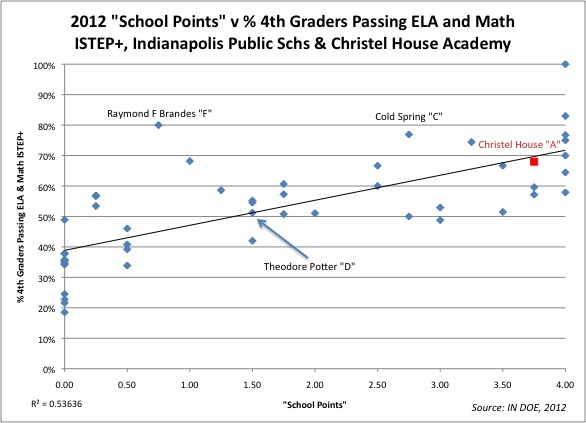 What we see instead is that Christel House was able to take advantage of a change in the rules of the game - a change that got them an "A," even though other schools that got poor grades had better passing rates in various grade levels. Again, nearly three-quarters of the school grade is "explained" by the passing rate - an absolute measure of school performance. In other words: in Indianapolis, if your school gets low scores it doesn't much matter how much you "grow," because so much of your school grade tracks with your absolute performance. So, it’s true that even the schools with the lowest pass rates have a shot at a C, so long as they get the maximum net growth adjustment, and also that the schools with the highest passing rates might very well get a lackluster final grade (a C, if they tank on the growth component). Not only that: as Bruce Baker has pointed out, there appears to be a relationship between test score "growth" and "performance"at the school level: the higher you start out, the more you "grow." I really don't know how New Jersey's growth model compares to Indiana's, but at first glance the basic construction seems similar: a "student growth percentile" with no covariates for student characteristics. They have to compete against schools that don't teach the same grade levels, which creates a bias against them. Because of poverty, they start out with lower "absolute" scores, which decreases their chance of showing "growth" in the IN-DOE's model. Even if they do show growth, the A-F system is designed to keep them from earning the highest grades, while affluent, high-performing schools can't get the lowest grades. The system has so little transparency and accountability that the commissioner can change the rules in the middle of the game. You wouldn't even need a guy like Tony Bennett at the helm for this thing to run aground (although it helps...). ADDING: Reading the emails, it's interesting that the IN-DOE staff views Grades 3 through 8 as a unit, and high school as another unit. There's no evidence that the staff understands it's possible that judging a K-6 school and a K-8 school may yield a false comparison. NJDOE Commissioner Chris Cerf Knows How To Pick 'Em! So, Barbara - how's the new job going? Morgan went on to suggest Nuzzi would be unable to get a job in New York City’s political scene as a result of her actions. “F***ing slutbag. Nice f***ing glamour shot on the cover of the Daily News. Man, see if you ever get a job in this town again,” said Morgan. It's just terrible to see Barbara's Morgan's career ruined by this f***ing t***! Why, after reading Nuzzi's account, people might get the idea Morgan doesn't know how control herself in front of the press! So I guess the career lesson here is that when you're on a sinking ship, the best thing to do is run to the press as fast as you can and start talking like a f***ing trucker. Right, Barbara? Nice job, Commissioner Cerf: not only did you hire a communications director who doesn't know the most basic rules of the game, you undoubtedly turned the coffee room at the NJDOE into a sailors bar. Barbara, I like your style - you're f***ing hired! Poor Weiner press spokesperson Barbara Morgan who I met on one of her first days at the job flacking for Joel Klein at the DOE. I always had fun with her. Boy does she make poor choices but these people will defend serial killers if it pays. Barbara, sweetheart, tone it down a little, OK? One of Jeb! Bush's most prominent "Chiefs For Change," Tony Bennett got drummed out of Indiana last year when he lost reelection for state superintendent of education. No matter: Jeb! pulled a few strings and got him his current gig doing the same job in Florida, where he has presided over one disaster after another. As Bob Sikes points out, Bennett's role as the "fiscal agent" for the Common Core test consortium known as PARCC actually followed him from Indiana to Florida, compromising his role as an objective evaluator of the testing regime. So between his own conflicts of interest, the conservative backlash against the Common Core in Florida, and the growing distrust over Florida's "statistically invalid" school grading system, the last thing Bennett needs is another scandal. Well, as they used to say over at Warner Brothers: cue the anvil. Former Indiana and current Florida schools chief Tony Bennett built his national star by promising to hold "failing" schools accountable. But when it appeared an Indianapolis charter school run by a prominent Republican donor might receive a poor grade, Bennett's education team frantically overhauled his signature "A-F" school grading system to improve the school's marks. 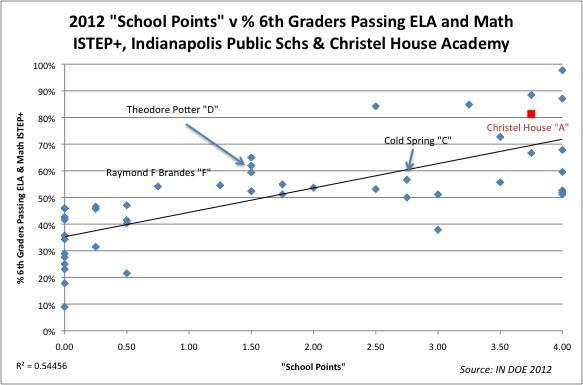 But trouble loomed when Indiana's then-grading director, Jon Gubera, first alerted Bennett on Sept. 12 that the Christel House Academy had scored less than an A. "This will be a HUGE problem for us," Bennett wrote in a Sept. 12, 2012 email to Neal. Neal fired back a few minutes later, "Oh, crap. We cannot release until this is resolved." Heh - "resolved." Sounds like a mob movie: "Vinnie, we need to resolve this current situation, capiche?" By Sept. 13, Gubera unveiled it was a 2.9, or a "C."
A weeklong behind-the-scenes scramble ensued among Bennett, assistant superintendent Dale Chu, Gubera, Neal and other top staff at the Indiana Department of Education. They examined ways to lift Christel House from a "C'' to an "A," including adjusting the presentation of color charts to make a high "B'' look like an "A'' and changing the grade just for Christel House. Dear lord - they changed the colors. Seriously. Bennett said Monday he felt no special pressure to deliver an "A'' for DeHaan. Instead, he argued, if he had paid more attention to politics he would have won re-election in Indiana. Yet Bennett wrote to staff twice in four days, directly inquiring about DeHaan's status. 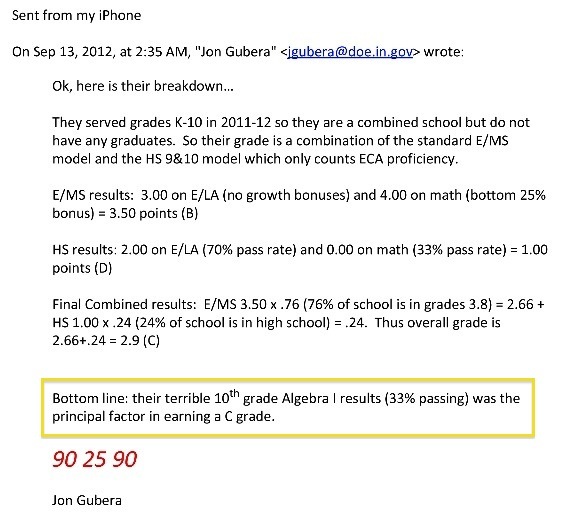 Gubera broke the news after the second note that "terrible" 10th grade algebra results had "dragged down their entire school." Bennett called the situation "very frustrating and disappointing" in an email that day. "I am more than a little miffed about this," Bennett wrote. "I hope we come to the meeting today with solutions and not excuses and/or explanations for me to wiggle myself out of the repeated lies I have told over the past six months." Save yourself a lot of headaches and hassle and just resign, never to work in education again. Where do I find these guys?! The city school district, operating under state control, has hired a North Jersey firm to assist in the opening of Camden schools this September. A one-year, $150,000 contract was given to the Antares Group, which is run by Mindy Propper, a former employee of the KIPP charter school foundation. Good thing Chris Christie and Chris Cerf rushed in to save Camden from itself by doing what NJDOE does best: handing out contracts to consultants! KIPP is, of course, the darling of the charter school cheerleaders: a national charter management chain that owes its "success" to a no-excuses ideology. Over the last couple of years, however, the curtain has been pulled back, and KIPP has had to answer charges that it "skims the cream," meaning it engages in self-selection and attrition practices that wind up creating a student body that's substantially different from the larger population. And it doesn't hurt that KIPP tends to spend more per pupil than its neighboring public schools. KIPP is, if anything, diligent in confronting its critics, and has worked hard to bat down criticism that it has gamed the system. But every time a study is published in its favor, further scrutiny shows that KIPP most likely isn't turning water into juice boxes: their "miracles" are actually pretty pedestrian. Except now it seems KIPP is conquering Camden - under their own terms. When the Education Law Center brought suit against the state for allowing KIPP to come into Camden, they pointed out many of the conditions for KIPP's new "Renaissance School" were defined in a way that would allow KIPP to engage in cream-skimming once again. Fortunately for KIPP, they have powerful friends in South Jersey: the new schools will be built under the aegis of Democratic boss George Norcross, who confiscated land next to his hospital that was supposed to be the home for a public school and made it the site for KIPP's expansion. Norcross's brother Donald, a state senator, has pushed through an amendment to the original Urban Hope Act that looks to put the project back on track - but the mostly cosmetic changes to the law all but ensure KIPP will be able to engage in practices of self-selection and attrition while spending more per pupil than the public schools in Camden. And now, to help facilitate all this, a former employee of KIPP will take charge of the district. So what do we know about Mindy Propper? A partner with KPMG Consulting and BearingPoint for nearly two decades, Mindy provided strategic and tactical guidance to global financial institutions including GE Capital, Chase and DeutscheBank formulating and implementing new service offerings, global operating systems and post merger business integrations. Mindy served as Chief Operating Officer for The LEAGUE (now part of The Points of Light Institute), an innovative web-based nonprofit focused on educating and empowering students to measurably improve their communities. Subsequently, Mindy joined the foundation supporting the charter school network, KIPP (Knowledge is Power Program) to build a team focused on providing seamless support to the network’s regions and schools enabling growth and sustainable performance. And so another businessperson - with no practical experience, training, degrees, or certification in running schools - is coming into a poor urban area to run a district with no accountability to the local citizenry. To be fair, Mindy Propper does have some experience with charter schools in New Jersey: she is the Board Chair for People's Prep*, a charter high school in Newark. The charter got a $350,000 grant from Mark Zuckerberg's Foundation For Newark's Future, indicative of Propper's connections to the Montclair-based school reform cabal (more about this later). So, who's coming up with the big takeover plans? Howell serves as a liaison to Camden for the creation of four Urban Hope Act charter schools. He reports directly to the deputy commissioner of education, Andy Smerick. Keep in mind that this scheme was hatched more than a year ago, and that includes identifying KIPP as a "partner." The last year and a half has been spent clearing the decks in Camden so the school system can be transformed into a "portfolio" district, with locally unaccountable charters taking the place of public schools under local control - and KIPP has been a key part of the plan. Remember: it was the Camden school board that originally put the brakes on KIPP's plans for expansion into Camden. But after both Norcross and KIPP itself put the pressure on, everyone eventually fell in line. Now the state runs the district, and the Camden charter industry will be free to do what they do best: segregate the kids, set up land grabs, and get their boyfriends cushy jobs. Last year, I laid out a bet for one of the state's greatest charter cheerleaders, the Star-Ledger's Tom Moran. Tom swore that the new KIPP school in Camden would be "serving every kid in the neighborhood"; I told him I'd wager a steak dinner on whether that turned out to be true. 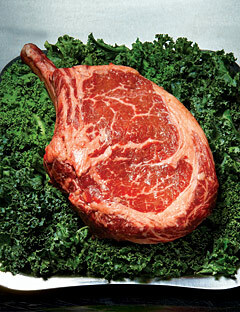 I take mine medium rare! * ADDING: Here's a curious report from Jon Pelto about another member of the People's Prep board, Adam Goldfarb. How does one serve as the Chief of Staff to the CT Education Commissioner and serve on the board of directors for a Newark charter school? Apparently, no one in Connecticut finds this odd. ADDING MORE: I am remiss in not restating an important point: KIPP failed in Camden once before. Back in 2009, when the going got tough, KIPP backed out of Freedom Academy, and left it wither away, eventually getting scooped up by the Democracy Prep network out of New York (KIPP may engage in selective student practices, but they are pikers compared to DP). I really need to state this every time I write about this topic: KIPP already tried and failed in Camden. No excuses? The frustrating thing here is that a lot of Yglesias's column makes sense. There is no doubt that poor children suffer in comparison to wealthier children in their learning outcomes due to variations in their summer experiences (a great argument, by the way, for not using test-based teacher evaluations, since we have no clue how students with varying summer activities are distributed across teachers). I think we need to be careful about how we develop summer programs, and we're going to have a hard time addressing whether such programs should be mandatory, especially for more affluent families and communities that already have what they feel are appropriate levels of summer activities. The contrast between America's rhetorical obsession with the bad educational outcomes of poor children and its blasé attitude toward summer vacation is striking. Conservatives have spent years pounding the point that a lack of money is not the problem in American public education. While it's true that there's much more to quality schools than money, the existence of summer vacation is a huge barrier to equal opportunity, and the barrier to year-round schooling is clearly financial. You'd need to install air conditioners, and you'd have to pay utility bills. You'd need to pay teachers and school staff more. But the gains would be obvious. OK, good: unlike Chris Christie, Yglesias is willing to admit that teachers don't get paid during the summer. But if that's true, how is imposing a two-month, unpaid furlough every year "doing something nice for teachers"? Yglesias and Christie both imply that teachers relish making a plan to get through two unpaid months every year; that somehow this is a perk of the job. My personal experience is quite the opposite: the days between June 30 and September 15 - the last and first paychecks of the school year - are hardly a gift. Most teachers I know do one of two things: work at a part-time or seasonal job (which usually pays even less than teaching), or provide care full-time to their own children, who are also off during the summer. And that doesn't include the work all teachers do between June and September to get ready for their next year at school, engage in professional development, or pursue advanced degrees. The research about teachers and non-school jobs is spotty at best. According to NCES, in 2008 about 17% of teachers worked outside of school during the summer; another 21% worked in their schools, but we don't know what the overlap between the two figures is (and we don't have a good estimate of how much teacher income in the summer is "off the books"). We also don't know how many teachers were taking care of their own children, which I would certainly argue is full-time work. In addition, these figures come from before the recession; more recent reporting puts the second job rate for teachers at one-in-five, although informal reporting goes as high as one-in-three or even one-in-two. But none of this really addresses the implication both Yglesias and Christie make: that teachers view having their summers off in exchange for not being paid as a perk. I searched around a bit on the usual academic databases trying to find some research about teacher attitudes toward summer break; at first glance, I couldn't find anything. The famous MetLife surveys don't broach the subject. 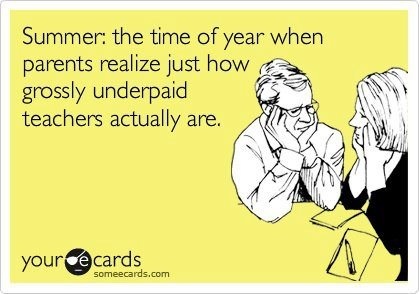 So how can anyone say that unpaid summer furloughs are a perk when we haven't even asked teachers whether they see it that way? Given how many teachers work in summer programs at their own schools, it's not too much of a stretch to think that, at a minimum, a healthy portion of the teaching corps would be glad to have a longer school year - provided they were paid for it, and that they would be guaranteed decent working conditions, including air-conditioned rooms. And I strongly suspect, given the large number of women in the profession, that even more teachers would agree to working a longer year if they knew their own kids were going to be in school as well. So let's stop implying that teacher attitudes are the primary impediment that keeps us from extending the school year. And let's stop saying that an unpaid summer break is a perk; it's reasonable to assume that, for at least a good fraction of the teaching corps, summers off is more trouble than it's worth. By now, those of us in Jersey are well aware of the construction trade unions' endorsement of Chris Christie, the biggest foe of public worker unions in the Northeast. I guess these supposed "allies" of teachers and cops think Christie's "pro-business" policies will lead to more jobs, even though the evidence suggests Christie is very bad for economic growth and job development. Whatever: it still stings mightily when, as a teacher, I see my union "brothers and sisters" out there shilling for a man who has done more to take money out of my family's budget than any other politician in the state, and who is gearing up for a run at national office. Weren't we all supposed to be sticking together as a united labor movement? After all, the leaders of New Jersey's public worker unions have happily stood up and endorsed public works programs when they meant creating union construction jobs. Here's Del Grosso supporting the Teachers Village project in Newark that, apparently, created union construction jobs for AFL-CIO members. Keep in mind that the NTU is affiliated with the American Federation of Teachers, which is, in turn, an affiliate of the AFL-CIO. And it was only with the AFL-CIO's support that the developers of Teachers Village could get the New Markets Tax Credits necessary to make this project so lucrative for the big-money boys who financed it. So it was, of course, perfectly natural that Del Grosso would support a project that would create jobs for AFL-CIO members in the building trades. But his members - the teachers and support staff of the NTU - ought to ask themselves: at what cost? Remember the name: Teachers Village. It's a $150 million, mixed-use development that just broke ground with great fanfare in Newark. The idea is that teachers will live in the complex and teach at one of the three charter schools that will occupy the site. The project was awarded nearly $40 million in Urban Transit Hub tax credits from the state Economic Development Authority and allocated $60 million in federal New Markets tax credits for the school portion. Other public financing came from the city of Newark, the state Casino Reinvestment Development Authority, and federal Qualified School Construction Bonds, according to an EDA memo. Private financing came from Goldman Sachs, Prudential Financial Corp., TD Bank and New Jersey Community Capital, Beit said. In the early months of the recession, Beit said, Berggruen’s unwavering commitment to the project — Berggruen said he considers his investment "long-term" — brought everyone else together. $100 million in tax credits; not too shabby. If anyone tries to convince you that billionaires are interested in charter schools solely out of altruism, point them to this project. Why else do you think the biggest Master of the Universe of them all showed up? A veritable who’s who of real estate developers, corporate leaders and elected officials gathered this morning to celebrate the groundbreaking of Teachers Village in downtown Newark and mark the start of a major project now underway. The apartments in the complex are studios to two-bedrooms that will range from $700 to $1,400 a month. Who do you think will be attracted to this housing: young people just starting out, or older couples with families? So much for experienced teachers working at these charters, although that has always been one of the key points of the charter "movement," hasn't it? Even here in Jersey (thanks, Darcie). Beit's got himself one sweet deal, doesn't he? He uses $100 million in tax credits to finance a project in Newark, then lines up a group of charter schools as his business occupants, who will pay their rents with taxpayer funds. Then, as if that isn't enough, he sets himself up to direct a steady flow of college-educated renters right into his residential units - through TFA! In fact, TFA has a page where prospective "teachers" can figure out their expenses when they move to Newark. By default, rent is listed as $1150: right in the range for units at Teachers Village. There's also a happy-happy neighborhood description on the TFA-Newark website: I don't think a real estate agent could have written one better. This is hardly a new idea: in Baltimore, 70 percent of Miller's Court's residents are TFAers. Again, the financing was helped by New Markets Tax Credits. The primary developer of Teachers Village, Ron Beit, sits on the board of Teach For America - Newark. One of the three charter schools housed at Teachers Village, TEAM Charter School (a KIPP school), is run by Ryan Hill, a 1999 TFA alum (Hill has also been asked back to cheer on new TFA grads). KIPP was instrumental in securing supplemental financing for Teachers Village: "With so many Teach For America corps members and alumni involved in TEAM Schools, the broker was eager to help both organizations." Another occupant of Teachers Village, Great Oaks Charter School, "strongly encourages" TFA alumni to apply. Cami Anderson, the pro-charter State Superintendent of Newark, is the former Executive Director of TFA-New York and a 1993 TFA alum. The Foundation for Newark's Future, fueled by the $100 million grant from Mark Zuckerberg, gave $500,000 to TFA. There is little doubt that TFA has many ties to Teachers Village, and that many of its corps members will rent apartments there. There is little doubt that the charter schools occupying Teachers Village will not have a unionized staff. And there is little doubt that Teachers Village is yet another step in the charterization of Newark's schools - a process that has led to budget cuts and school closings against the will of parents, students, and the elected yet powerless school board. Newark Public Schools, under state control for decades, has already announced its intention to layoff staff; NTU leadership walked out of a budget meeting in protest. The unionized teaching jobs in Newark are being converted into non-unionized teaching posts in charters, often filled by TFA corps members. And yet, despite all this, NTU's leaders have heartily endorsed Teachers Village: a project that will accelerate the growth of charters and the deunionization of Newark's Schools. Is NTU unaware of what is happening in Chicago? In Philadelphia? That TFA is still pushing to place its members in these cities even as experienced, tenured, unionized teachers are being laid off? That non-unionized charters are an important part of TFA's clientele, with one-third of TFA's recruits placed in charters? Given all this, how does supporting Teachers Village help support NTU members? As I have said many times before: I am a union guy. AFT-NJ and the NTU know that I am on their team. And I completely understand that when you're part of a larger organization, you sometimes have to do something you don't particularly want to do, if only to show solidarity. But this, in my humble opinion, goes too far. It's fine to create private-sector construction jobs through public investment; we should do a lot more of that (remember the ARC tunnel, Christie-supporting union members?). But we shouldn't create construction jobs at the expensive of unionized teacher jobs. We gotta start thinking about the long game, fellas. I'm just trying to get you to see that. 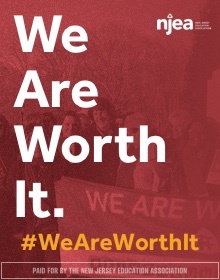 This blog remains a proud and loyal supporter of AFT-NJ, and the Newark Teachers Union. REPOST: Chris Christie: Liar, Fool, or Both? 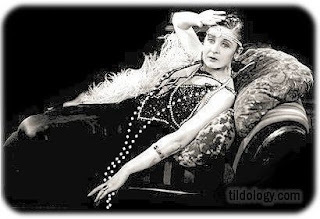 Marie Corfield Money Bomb: Thursday, July 25! Does DFER Support Pitbull-Zulueta Values?